Last summer, I've downloaded a special audio clip on positive affirmations courtesy of Prolific Living. Prior to that, I've been reading a lot of articles on positive affirmations and I think it's really helpful when you want to stay positive in dealing with your everyday life. I used to be a kind of person who easily panic and get affected with problems. I also get to the point of treating minor problems as a major catastrophe during my younger days. I think, what they used to say is always true..."with age comes wisdom and maturity". But of course, I am not saying that I am totally calm now in facing problems and difficulties, I do sometimes get affected but the way I handle these now is far better that how I used to before. Listening to the audio clip on positive affirmations at the start of my every day can give me some kind of motivation to face each brand new day with high hopes and lots of positivity. I used to listen to this audio clip while I am sipping my first cup of coffee in the morning. You can also listen to your favorite songs afterwards, in my case, listening to vh1 top 100 songs of the 80s really works to put me in the right mood. This is just a motivation though, of course nothing beats the power of prayers but it always pays to be positive especially when you face life's daily challenges. This has been one of the many positive changes I've adopted to my life recently since I've decided to stop working full time and stay at home with my family. The Positive Affirmation audio book is free and you can download it online. 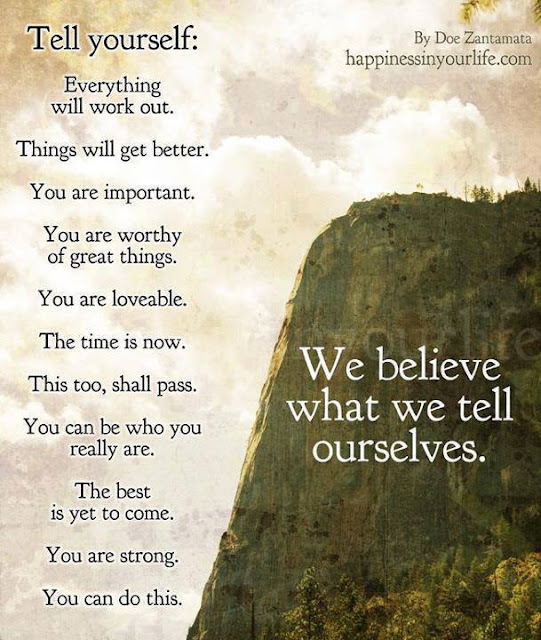 We believe what we tell ourselves!